Summer is well and truly in full-force, and these hot sticky days are wreaking havoc on my daily dressing ritual. Choosing an outfit that beats the heat as well as being sweat-patch proof is essential. Thankfully, the Summer season tends to be a little more stress-free when it comes to dressing, with summery, floaty dresses and skirts being the perfect go-to’s. Streamline your Summer wardrobe with these 5 wardrobe essentials to give your Summer look a boost and make the most of the sunny days still to come! The all-white look is hot, hot hot for Summer. I love how this Asilio dress features a gorgeous sheer skirt attached to a scalloped embroidered mesh mini dress to give it a contemporary edge and a fresh new spin on the classic maxi. 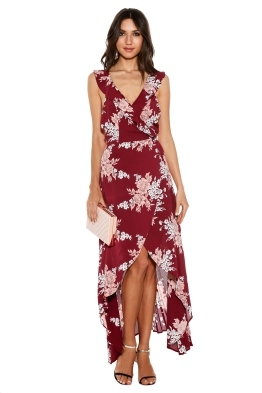 What’s great about this dress is that it’s such a versatile piece which can be comfortably during a classy cocktail hour with the girls or a more formal affair such as your engagement party. The boat neckline is another statement aspect to the dress and pairs well with classic drop earrings. A lot of people shy away from the head-to-toe white look but it is more wearable than you think; the trick is to counter-balance it with metallic or warmer accents. Sometimes black is too much of a contrast, especially over Summer, so look to bronze, gold and copper hues for that extra pop. Everyone needs a classic mini dress in their Summer wardrobe. There’s always something so fun & flirty about a classic mini – not to mention there’s no better feeling than the Marilyn Monroe-esque breeze wrapping around your legs on a hot day! Oftentimes the mini dress can be dangerous uncharted territory – how short is too short? Can I still wear a mini dress? How can I shift my position without flashing everyone?? But as long as you avoid Subway grates, then the easiest way to avoid this mini dress anxiety is to select a dress which is playful but still has some modesty intact. 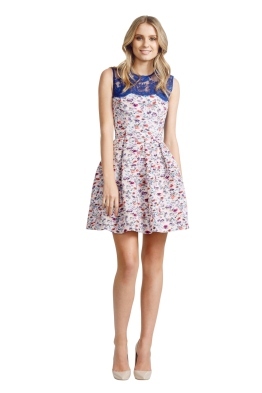 This Alex Perry mini dress is exactly that, it has a pretty floral print which is flattering on anyone, and the above-knee hemline is cut into a comfortable tulip skirt which flares out at the waist. To keep things in place, think about investing in an undergarment slip which will protect your modesty but still allow you to stay cool – that way, you can rest a little more easy if one of those ‘oopsie’ slips happens. Also, consider exchanging high heels for flat peep-toes or sandals for a casual day cocktail look. Finish your outfit with a mini clutch or purse. 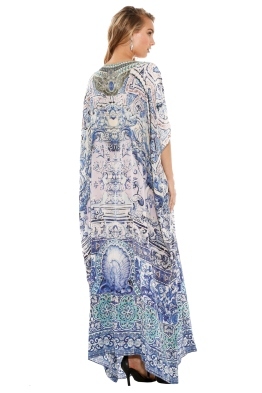 A kaftan should always be a Summer wardrobe staple! These gorgeous floaty creations are delicious to wear, especially poolside or at the beach. I feel like I have my own personal air conditioner when wearing one of these as they are so breathable. 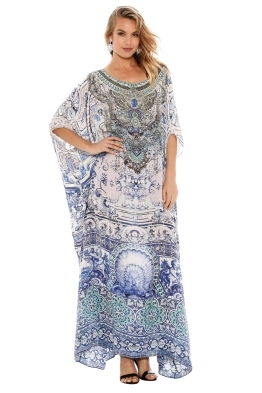 The Temptress Kaftan by Camilla is a gorgeous ocean blue hue and is such a versatile piece for Summer – wear on its own with sandals or a stylish wedge for a perfect daytime look, or throw over your bathing suit after your afternoon dip. Have a look at our Blog post for tips on how to wear Camilla this Summer! If you’ve never worn a playsuit before then you’re in for a treat. These warm weather beauties are a must-have for your Summer wardrobe, adding style and movement all in one! The elasticized waist on this Camilla playsuit adds to the comfort factor, while the silk crepe fabric is feather-light. What makes this playsuit a real standout though is the open drop off-the-shoulder detail. This is a great outfit to reserve for an outdoor event or Summer party and looks so fab with knee-high lace up sandals! The trick to pulling off the playsuit is to pick the right length and style to suit your body type. For ladies with a fuller bust, look to V-neck style playsuits or a button-up shirt style. Girls with a pear shape or smaller bust look gorgeously balanced with a playsuit that features embellishments around the neckline or one which cinches at the waist. This off-the-shoulder style is so versatile and flattering on all body types! A beautiful take on the maxi dress, this cascading Privacy Please dress will take pride of place in any Summer wardrobe! Another classic example of a versatile dress, the asymmetrical wrap hem and deep V-neckline with feminine ruffle detail is a romantic touch for a Summer wedding or date night. Floral prints are a gorgeous trend this season, adding softness, femininity and a classic elegance which makes it so timeless. Complement a floral print dress with an understated clutch or a large wide-brimmed hat and rock out the rest of Summer in style. The Summer season is all about get-together’s and parties! Take inspiration from our wardrobe essentials for Summer and play around with these different on-trend styles. If you have an event coming up perhaps think about renting from our range of daytime dresses perfect for a Summer party or a special occasion!